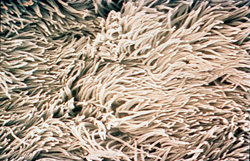 A normal trachea is filled with healthy cilia. Clinical signs are similar: coughing, nasal shedding, fever, lethargy and loss of appetite. The risk increases with exposure to other animals or people. Vaccinations for horses as well as humans are an important part of preventing disease. Rest is an important component of recovery for both species. “The incidence of horses being affected varies from year to year,” says D. Craig Barnett, DVM, senior equine technical services specialist for Intervet Inc/Schering-Plough Animal Health of Paola, Kan. “Suffice it to say that equine influenza is the leading cause of infectious upper respiratory disease in the horse. “Like in humans, the potential for exposure, or risk, to our horses increases as the horse population grows,” he says. Also increasing exposure: more frequent and extensive traveling in today’s equine world. If a horse’s immunity is built up, he will usually get over the flu quicker, says Robert Holland, DVM, senior technical services veterinarian for Pfizer Health’s equine business unit. “Every day a horse has a fever will take it one week to recover,” Dr. Holland says. “When the virus destroys the ciliated hair in the respiratory tract, the horse coughs and brings up mucus due to the infection. Respiratory tree cells regenerate in 14 to 21 days, and it is important to avoid a secondary bacterial infection. “I like to remind owners how long it takes them to fully recover from a bout of influenza to the point where they would feel like exercising or competing,” says Dr. Barnett. Antigenic drift, or changing of the virus, occurs in horses at a much slower rate than in humans, Barnett says. Of the two main subtypes of equine flu¬, A-1 and A-2, A-1 hasn’t been seen for 15 years, Holland says. A-2 was first discovered in Miami in 1963 and has two main family lineages: American, found in horses in North and South America, and Eurasian, found everywhere else, although the flu recently found in Japan and Australia appears to be an American-like strain, he says. Holland helped to write the American Assn. of Equine Practitioners’ vaccination guidelines as a member of a panel of U.S. veterinarians. Veterinarians using human flu test kits are getting good results testing horses for influenza stallside, Holland says. The internal proteins in human and horse flu viruses are similar, though the outsides are different. The $25 to $35 Directigen kits look for internal proteins–the swabs show a triangle for positive cultures and a dot for negative ones. Nasal swabs can be submitted by overnight courier for testing to state labs, veterinary laboratories or vet school laboratories. There is no charge if veterinarians who suspect flu test at the Maxwell H. Gluck Equine Research Center in Lexington, Ky. The intranasal vaccine works well, Holland said, although the intramuscular ones also offer good protection. Vaccine manufacturers are searching for different–and better–ways to fight influenza. Merial of Duluth, Ga., has developed a recombinant vaccine that uses the canarypox vector, which stimulates both a cell-mediated response as well as a humoral immune response. Its Recombitek Equine Influenza Virus vaccine, proven against a highly virulent American strain of equine flu, significantly reduces viral shedding, which in turn may help stop the spread of the influenza, says April Knudson, DVM, an equine specialist with Merial’s large-animal veterinary services group. Knudson says Recombitek covers both ends of the immunization spectrum, acting like a modified-live vaccine while being a recombinant one. It is administered intramuscularly. She says there is no possibility of horses getting an influenza infection from the recombinant vaccine. Merial’s vaccination technology has been used successfully for more than a decade to immunize dogs, cats and horses. “Scientists want to prevent flu from infecting horses,” says Holland, who hopes that manufacturers will develop vaccines that will protect animals longer. Present immunizations last about four to six months, so the horses must be vaccinated at least twice a year. Barnett would like to see vaccines updated to contain an A/equine/South Africa/4/03 (H3N8)-like virus (American lineage) and an A/equine/Newmarket/2/93 (H3N8)-like virus (European lineage). “Horses move around so much–shows, events, pleasure barns, races–that chances are always good that they will come in contact with the virus,” Holland said. Studies show that immunizations don’t help foals 6 to 9 months old because of maternal antibodies. Yearlings to 3-year-olds usually contract flu at least for the first time, except in Warmbloods, because most of those don’t leave the farm until they are 5. “Vaccines, especially IM vaccines, need to contain strains that are antigenically similar to field strains for adequate and proper antibody production,” Barnett says. Intervet’s IN MLV Flu-Avert vaccine provides more complete and longer protection. “Many different isolates/strains are known to circulate in the horse population and many of these isolates/strains are know to be antigenically similar if not identical,” he says. Intervet’s IN MLV Flu-Avert vaccine provides more complete and longer protection, Barnett says. Flu can race throughout a barn. And equine flu has jumped to dogs. Many times, a virologist and small-animal vets will need to work together with an equine practitioner. Large kennels, human societies and racetracks all have history of horses and dogs being in close proximity. “As horse owners and veterinarians, we tend to think that the horse is immediately protected following vaccination and that the protection is 100 percent complete,” Barnett says. “Unfortunately, at least 14 days must be allowed for the horse to respond to the vaccine. Many vaccines require two doses for primary immunization. In light of an infectious outbreak, Barnett says, “Booster vaccinating the rest of the herd with an intranasal influenza vaccine may help control the spread of disease. Dr. Doug Herthel, DVM of Alamo Pintado Equine Center in Los Olivos, Calif., recommends that veterinarians keep horses’ immune systems high by encouraging owners to provide their animals with proper nutrition.